Mystic Vale was a highly anticipated game for me since I first heard about it via an AEG press release in Spring 2016. I have always loved deckbuilding games, and this new release promised to be a revolutionary change to the genre. Instead of changing your deck via adding and deleting cards, Mystic Vale would allow you to change the cards themselves! So, instead of being a deck builder, a new term was needed to describe the game: a card-crafter. In this game, players start with an identical deck of 20 cards. The game comes with a passel of clear card sleeves, and each card is safely ensconced in its own sleeve. The rest of the “cards” are clear plastic cards which have printing on about one-third of the card. There are three different levels of these advancement cards – and they are organized by level on the table. Three cards from each level deck are laid out as a display. There is also a special Fertile Soil type of card which is left in its own stack. There are also two levels of Vale cards; these are shuffled and four of each type are face up as a display as well. Each player is given a blue mana token; one of these will randomly determine the start player of the game. A number of VP tokens are counted out and placed on the table in a pile. At the start of the game, the cards in a player’s deck are fairly simple. The main attributes are found on the left hand of the card. These would be the light blue mana circles and the red decay symbols. Later advancements may also place shield shaped VP symbols there, spirit symbols (yellow stars, green leaves, brown paws or purple wild swirlies), and some green growth symbols. To start the game, players shuffle their deck and then perform the final phase of a turn, namely the Prep phase. Cards are dealt from the deck and placed face up on the table in the active zone. They can be laid one on top of the other so long as the left edge of each card is visible. As you deal a card to the table, you immediately flip up the next card and place it face up on top of the deck. This card on the deck is not considered in play, but rather is called the “on deck” card. If you have not reached the end of the phase, the card in the “on deck” position is moved into the play area and the next card on the deck is flipped up to be on deck. You continue flipping and dealing cards until you can count three red decay icons in your play area AND your on deck card. Once all players have done this – the game can start with the start player. Harvest Phase – In this phase, you buy Advancements and Vale cards. You first total up all the blue mana icons on your cards as well as all of the colored square Spirit symbols. Clear Advancement cards are purchased with the blue mana icons. If you need a single additional icon, you can exhaust your blue icon mana token and turn it to the grey side. You are able to buy up to two Advancement cards in a turn. Place these purchased cards off to the side. You can also buy up to two Vale cards in this phase; you must use your spirit tokens for these. Any purchased Vale cards are put face up in your play area but you cannot use any of their abilities until the turn after which you acquire them. While in this phase, you should also score any VPs seen in green shield icons on the left of your played cards. Take VP tokens from the table and place them in your supply. (Therefore, if you spoiled in the Planting phase, you would skip the entire Harvest phase, and thus you would not collect any VPs for your cards in your play area.) There are some advancements that have an effect in this phase; you make apply this effect at any point in the Harvest phase. Discard Phase – you now add any purchased advancement cards to any of the cards which were currently in play for you this turn – NOT your on deck card. The advancements can be added to cards so long that none of the horizontal text from previously placed cards is overwritten. 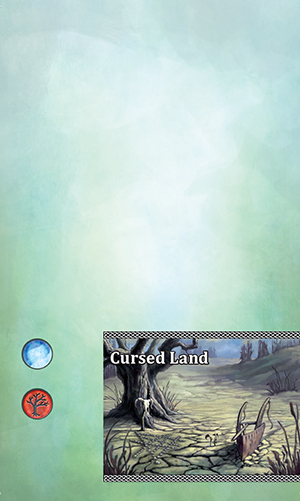 Some cards do have a vertical banner (just to the right of the left-hand icon area – and you can overlay this information; if you do so, the information which you are able to read is the instruction that you follow. Once you have placed all your newly purchased Advancements, discard all cards played this turn into your own discard pile. Then, replenish the supply of Advancements and Vales. If you Spoiled (by getting 4+ red Decay icons in the Planting Phase), you may also turn your mana token back to the blue unused side at this time. Spoiling is the only way to turn this token back over. Prep Phase – like the start of the game, slide cards from your On Deck area into your play area and reveal a new On Deck Card. Continue this process until you can see three red icons in you play area/on deck card. Then the next player can take his turn. If there is a tie, the player with more Level 3 advancements wins. Like many similar games (i.e. deckbuilders), the winner of Mystic Vale is the one who is best able to manipulate his cards so that they work together efficiently. Unlike most games in the genre (assuming that you even consider Mystic Vale as part of the deckbuilder genre instead of the first in a new genre of Card Crafters), your deck is always the same size here – you will always have 20 cards in your deck. The change here is the composition of the information on those cards. Early in the game, the main decision is adding on Level 1 advancements versus increasing your buying power. 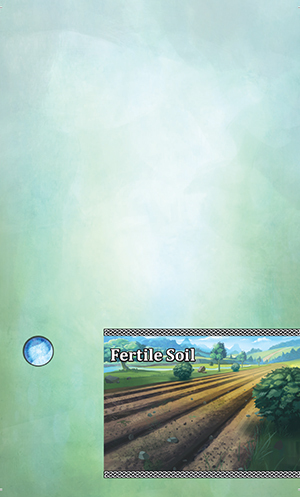 The Fertile Soil cards – which you’ll remember are a separate stack in the supply – essentially give you an extra blue mana icon for the space in your card sleeve. The Level 1 advancements generally cost between 2 and 4 mana, Level 2 between 5 and 7, and the Level 3 generally cost 8-10. 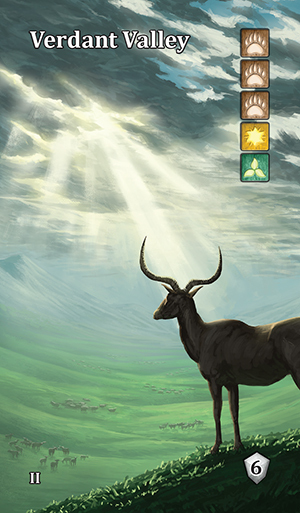 In our experience, the Fertile Soil cards are rapidly exhausted, and then as players are able to generate more buying power, then the Level 2 and Level 3 cards come into play. Adding these mana producing advancements is not the only way to increase your buying power. You can also get actions which allow you to specifically choose cards from your deck/discards OR discard cards from play (which would allow you to discard red Decay icons) so that you are able to deal more cards into your play area. There are also certain Advancements that allow you to ignore any Red icons on that particular card. Finally, you could add Green growth icons to cards; each of these green icons cancels out a Red decay icon (even if it’s on a different card). All of these changes will allow you to deal more cards to your play area, which in turn should lead you to being able to get more buying icons on the table. Counting cards can be an important skill. When you start the game, you have 9 cards with red tokens out of your 20. As you change your deck, knowing how many total cards have red icons on them (as well as knowing how many are left in your draw pile) will help you calculate the odds of Spoiling. The penalty for Spoiling can be severe – not being able to buy a card nor collect any VP tokens from icons – but there are times you simply need to push your luck in order to get enough icons to buy a specific card. Knowing the composition of your remaining deck is an important tool in deciding when to go for it. The game (at this time) is mostly static – in the game, all Vale cards as well as Level 2 and Level 3 Advancements are always in the supply. There is a selection of Level 1 Advancements which are discarded in setup. However, due to luck of the draw, the order in which the cards come up is variable in each game, AND we generally don’t get through all of the card stacks before reaching the game ending condition. Sure, after 7 games, we’ve now seen all the different cards, and we know what we might be able to expect – but it doesn’t feel tired yet. Furthermore, AEG has already announced that there are expansion cards on the horizon, and the addition of new cards will certainly freshen things up. The plastic cards are a cool mechanism, and to the best of my knowledge, this is the first game to use clear plastic cards in such a manner. They aren’t the easiest to shuffle, but we manage to do it by spreading them on the table and pushing them around to mix. Each card also comes with a protective plastic film sheet on them; we didn’t specifically take these off, but we have been doing them as we play each time we see the frayed edge of the film on the card. The card sleeves have stood up to play thus far, and AEG has included a number of extra sleeves in the box to ensure that you are able to replace any split sleeves. 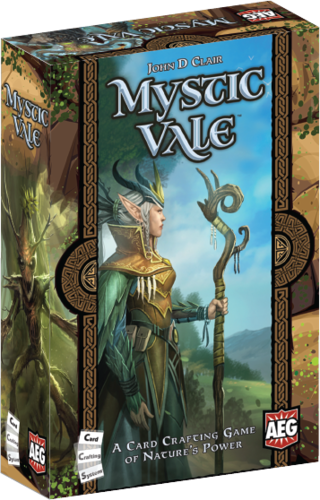 On the whole, I am really excited about Mystic Vale, and though I feel like I have seen all the cards now; there is still room to explore how to use them together. Also, the fact that you have to put newly purchased Advancements in the cards used in that particular turn means that you can’t always combine the same Advancements together in the same card sleeve all of the time. And, though there is an obvious limitation from the fixed card set, the promise of expansion(s) in the near future portend many new experiences to come. The rules even point to a new release in the future which uses this same card crafting system but will also have “aspects of worker placement, deck building and fast-paced combat”. Mary Prasad (3 plays): In general, I really like Mystic Vale. It has a unique and interesting mechanism with the clear cards for customizing your deck cards themselves! Having a choice of cards in which to place an improvement, as well as three slots in the card itself, presents a number of choices. I tend to place cards with the decay (red) icons in separate sleeves so I don’t get a surprise spoilage in one card – although of course I will put them in the card that says to ignore them. I also try to put as many in one sleeve as I can rather than spread them out amongst the cards; it’s easy to bypass the blank cards to get to the “meaty” ones. One issue though is that these cards will feel thicker when shuffling; you can feel where they are in the deck. Some suggest letting an opponent shuffle the deck, but they can also feel where the thicker cards are located (plus it’s a pain to have someone else shuffle each time you go through your deck). This is probably a minor issue with honest gamers but worth mentioning. The only other possible problem is in games where someone was able to get the Vale card worth 6 points, that player won – this may have been due to experience but it also might indicate that the card is a bit too powerful.